NO BEGGING, no waiting for table scraps…. no people food, unless it is in my bowl. I have slowly learned these lessons. I used to jump in everyone’s lap when they were eating, but I have learned that it is no use. Now I just wait, and when nothing drops from the table for a few minutes I go and find 4 or 5 toys to play with. If I am REALLY lucky I get a bully stick to chew on while everyone else is eating. I can’t resist the smell of cooking. Whenever there is food being prepared in the kitchen that is where you can find me. I love smelling all food being cooked…. and sometimes a few pieces drop for me to eat as well. On the whole I don’t beg…. mostly because I eat BEFORE everyone else. I usually eat about 30 minutes before so that my tummy is full when everyone else is eating. Treats are a completely different story. I am apparently allowed to beg for treats. In grandma and grandpa’s house I know where the treats are, so when people go over to those particular spots I follow them just waiting. I know my commands so I will get a treat every time. I am still learning to roll over, but I’ve got sit, down, wait, off, shake, high five and kiss. Lastly, there are some treats that make your breath smell…. I apparently don’t get these treats anymore. I DO LOVE THEM, so I guess I will have to wait until the bad breath doesn’t last that long so that I can get them again! 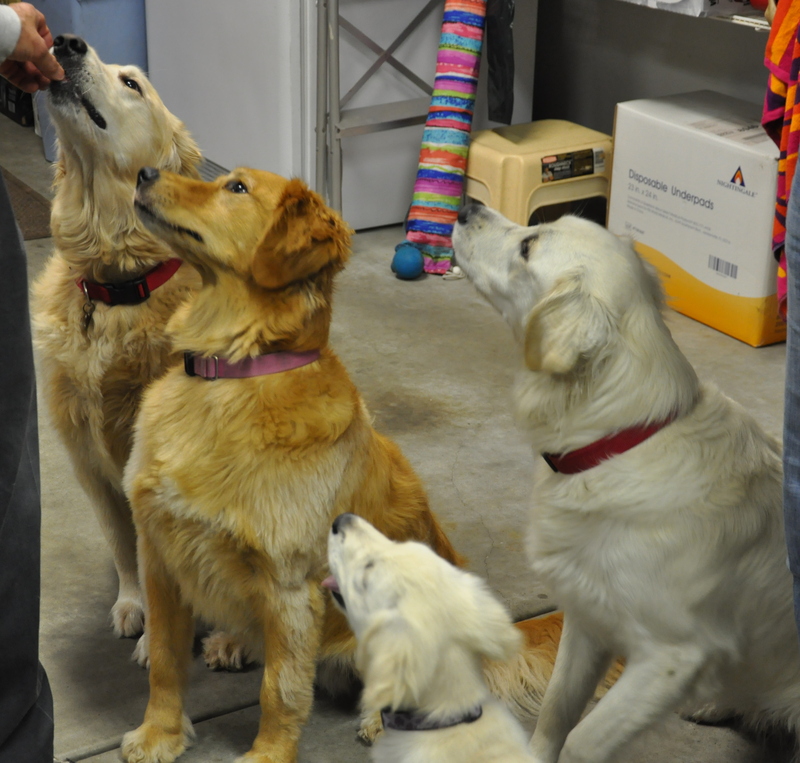 Look how patient we all are while we wait for our treats!